Is Drew Sutton the next Ben Zobrist? In 2009, Ben Zobrist exploded onto the national scene with an All-Star season. The Tampa Bay Rays super-utility man hit .297/.405/.543 (AVG/OBP/SLG) with 27 home runs and 91 RBI. The seeds for Zobrist’s success were planted by a former collegiate baseball player named Jaime Cevallos. Zobrist was not alone in his workouts with Cevallos. Houston Astros farmhand Drew Sutton also came along for the ride. Sutton and Zobrist have been linked to each other from day one of their professional baseball lives. The pair of middle infielders were selected by the Astros in the same 2004 amateur draft (Zobrist round six, Sutton round 15). They would move through the minor leagues in near unison until Zobrist was traded to the Tampa Bay (Devil) Rays in the summer of 2007. Sutton would stick around with the Astros for a little longer before being sent to the Cincinnati Reds for infielder Jeff Keppinger in early 2009. Like Zobrist, Sutton was a decent minor player, but nothing special. He was a nice hitter, but did not display the power potential of a big-time prospect. While playing for the Astros Double-A affiliate in 2007, he hit .269/.351/.388, with nine home runs and 28 doubles – typical numbers for a good-but-not-great middle infielder. Then came Cevallos’ instruction. Playing for the same Double-A affiliate in 2008, Sutton ramped his production up to .317/.408/.523. In just 48 more plate appearances (558 in ’07, 606 in ’08) he racked up 21 more extra-base hits. He more than doubled his home run total from nine to 20 and also hit 39 doubles. Not only did his slugging percentage increase by .135 points, his raw power, displayed in ISO (Isolated power, slugging minus batting average), also jumped from .119 to .206. In 2009, Sutton played 44 games for Cincinnati’s Triple-A team. In his brief 190 plate appearances, he rapped 19 extra base hits (five home runs, 14 doubles) and slugged .471. When we take his .261 batting average out of the equation, we can see that his ISO actually increased from .206 to .210. After an early July major league debut, Sutton appeared in 42 games for the Reds. He hit just .212/.297/.348 in his first big league action, but we can’t much stock in a small sample of 76 plate appearances. When interviewing Cevallos about Zobrist, I asked him how many home runs Zobrist could hit if given enough playing time. Cevallos said he would hit 30 home runs. Zobrist came up just short with 27. I recently contacted Cevallos about Sutton, and asked him a similar question: If given 600 at-bats, how many home runs would Sutton hit? Cevallos said, 25. He also noted that while both players had similar power, Zobrist’s swing would lead to a higher batting average, but Sutton’s stroke could produce a lot of doubles. The Sutton/Zobrist comparison is showing itself once again in 2010. Like Zobrist in 2009, Sutton enters 2010 spring training without a regular job and or an obvious position, after playing five positions (2B, SS, 3B, LF, RF) in ’09. That also sounds a lot like Zobrist, who has started at seven different positions for the Rays (every position except P and C). On the infield, the Reds have unquestioned starters in Joey Votto, Brandon Phillips, and Scott Rolen. Orlando Cabrera was signed to be the team’s shortstop, but could see a challenge from Paul Janish. Heralded prospects Jay Bruce and Drew Stubbs make up two-thirds of the outfield with Jonny Gomes and a partner to be named later in left field. All positions seem relatively settled; however, Sutton’s versatility could come into play. The obvious holes in the Reds lineup are shortstop and left field. Gomes mashes left-handed pitching (.274/.369/.517), but is sub-par against righties (.224/.311/.448), particularly for a player who struggles on defense. At short , the 35-year-old Cabrera has averaged .275/.322/.398 in his career; he’s a minor offensive threat at this stage of his career. Janish has been an awful hitter in his brief major league career (.205/.290/.292) after being average in the minors (.261/.351/.382), but is a good defender. Outside of those two positions, there is always the unforeseen injury. The surprising knee injury to Rays starting second baseman Akinori Iwamura in ’09 opened the door for Zobrist in 2009. 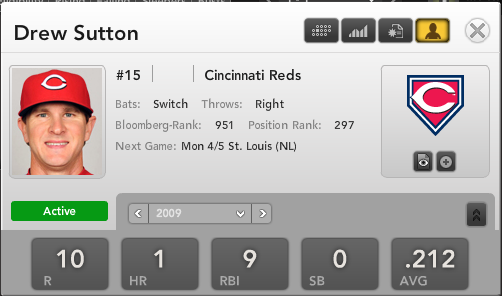 With Scott Rolen and his injury history (124 days missed over last three seasons) manning third base for the Reds, there may be an opportunity for Sutton to steal some at-bats that way. Of course, Zobrist may have caught lightning in a bottle in 2009, and Sutton may not respond to Cevallos’ instruction — or other factors that led to Zobrist’s success — the same way as his former teammate did. Sutton isn’t worth a draft pick in standard 10- or 12-team mixed leagues. But in a deep NL-only or larger mixed (18+ teams) league, he’s a good gamble toward the end of the draft. His B-Rank of 951 is so far off the radar that most people won’t even notice him, meaning you can snag him with your last pick. Then again, check out Zobrist’s year-by-year B-Ranks. To keep tabs on Drew Sutton, and hundreds of other players, check out Bloomberg Sports’ fantasy kits. The advent of Ben Zobrist Volkl skis was really a magnificent one, to say the least. After all, I could not agree more the way he came into the national scene and that too with an All Star season. He had around twenty seven home runs and also ninety one RBI. Something that is quite remarkable. Anyway, one thing I am surprised to know here is the fact that he had a former collegiate baseball player Jaime Cevallos who has played an integral part in his success!